The Virginia Woolf Society of Great Britain kindly invited thecharlestonattic to attend their annual conference at the National Portrait Gallery to coincide with the Virginia Woolf, Art, Life and Vision exhibition. Professor Frances Spalding gave a fascinating account of her decision-making process as curator of the Woolf exhibition in her paper ‘Protean Woolf’. 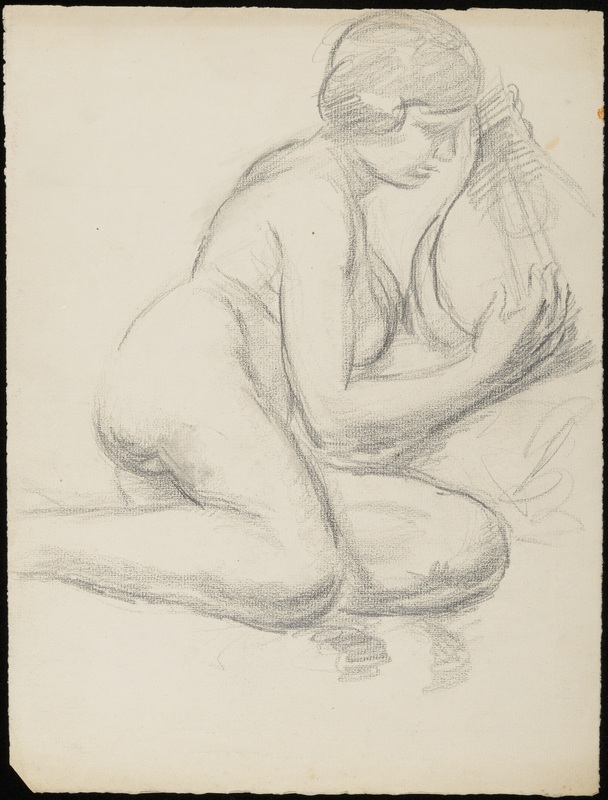 Spalding revealed that her curatorial choices aimed to highlight Woolf’s protean qualities and the mutable and boundary crossing nature of her work, rather than presenting a single fixed interpretation. She chose to focus on Woolf in her own contemporary contexts, noting that the writer’s ‘extraordinary posthumous life’, and habit of employing hyperbole, had presented difficult questions in terms of how to represent this iconic figure. Emeritus professor Maggie Humm‘s talk investigated the impact of Woolf’s portrayal of their mother and use of lighthouse imagery in To The Lighthouse on Vanessa Bell’s visual practice. The lighthouse was a potent symbol of their childhood holidays in St. Ives and is a motif that recurs in both women’s work. Humm suggested that Bell’s encounter with her mother and the lighthouse of their childhood in the pages of her sister’s novel resulted in several works where Bell attempted to directly address maternal loss, including Pink, Blue and White Flowers in a Vase of 1928. Humm made the case that this still life, which shows what the speaker convincingly argued is a photo album with a page ‘curling as though memory is moving out into the room’, was a reworking of a 1923 painting containing many of the same elements. The 1928 painting presages a later 1945/1951 painting again with similar elements, reproducing a Julia Margaret Cameron photograph of Julia. Bell wrote to Woolf that it was ‘shattering to find oneself face to face’ with her parents again in TLL, and these still lifes address her mother’s spectre with new insight. Homages to their mother and images of lighthouses featured regularly in both women’s work after this point. 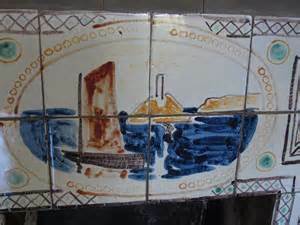 The tiles around Woolf’s bedroom fireplace at Monk’s House – inscribed ‘VW from VB 1930’ – were created for her by Bell in 1930. The large oval panel in the centre depicts a lighthouse, recalling Bell’s bookjacket for To the Lighthouse. 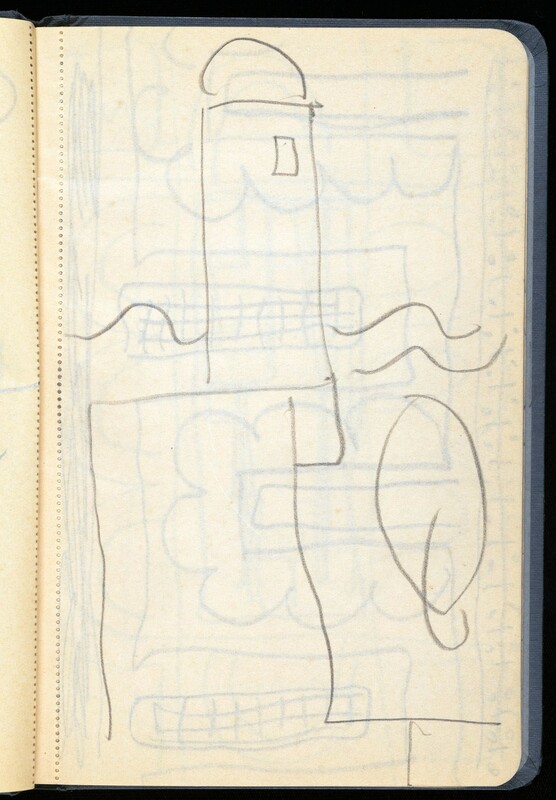 Several lighthouse sketches figure in the AGG supporting the idea that the lighthouse is a resonant intertextual motif, evoking childhood memories and deeply seated emotions. The panels in 52 Tavistock Square include paintings of books, writing implements, and musical instruments, and these motifs suggest Virginia Woolf and her husband Leonard’s activities in their sitting room. Whilst the literary lives of Virginia and Leonard Woolf are well documented, their love of music – implicit in Bell and Grant’s decorative scheme in the recurrent image of a mandolin – is not as widely known. The panels are no longer extant as the house was hit by a bomb in October 1940 during the Second World War. However, there are sketches of similar subjects in the Angelica Garnett Gift. In particular, drawings which incorporate a mandolin appear numerously, an example of which is shown below. 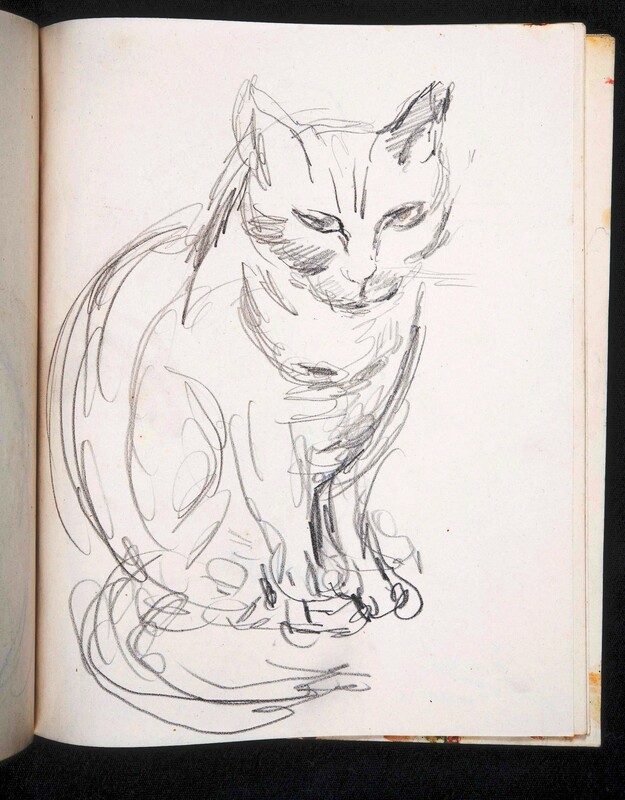 These sketches of lounging cats come from another sketchbook labelled ‘VB’ for Vanessa Bell. 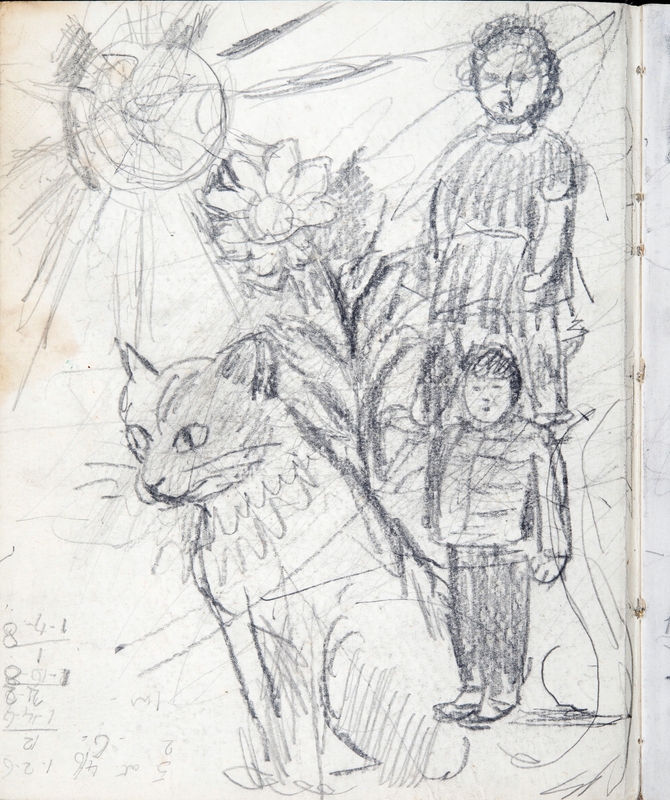 Bell may have had a little help from her children with this rough sketch on the back of the front cover! There were always cats at Charleston, a particular favourite was called Marco Polo. Although cats aren’t often mentioned in the literature about Charleston, we rather suspect the artists harboured a soft spot for them! 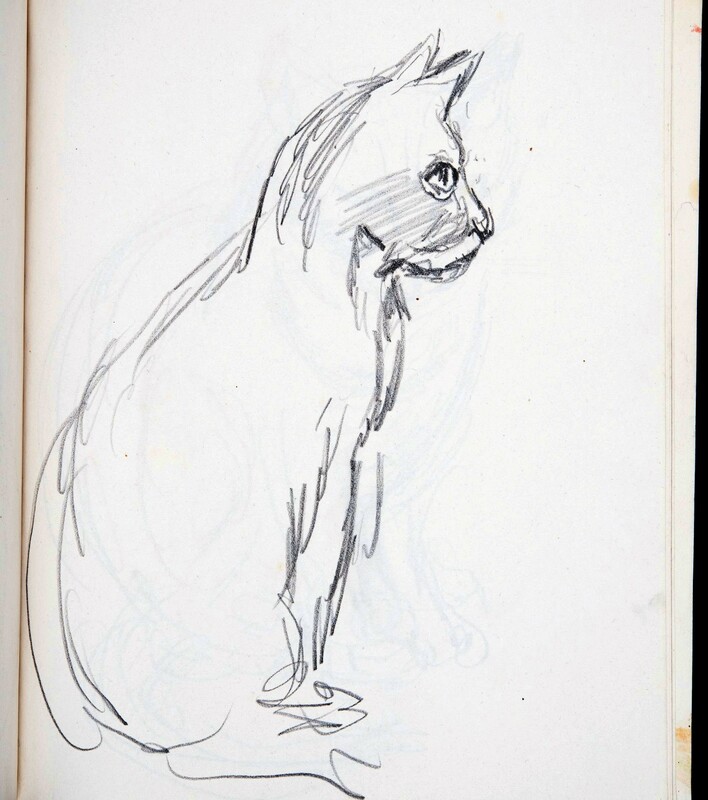 Another of Bell’s cats was shown at the Herbert F. Johnson Museum of Art, Cornell University, New York as part of their 2009 ‘A Room of Their Own: The Bloomsbury Artists in American Collections’ exhibition. They have kindly allowed us permission to use their photography here. 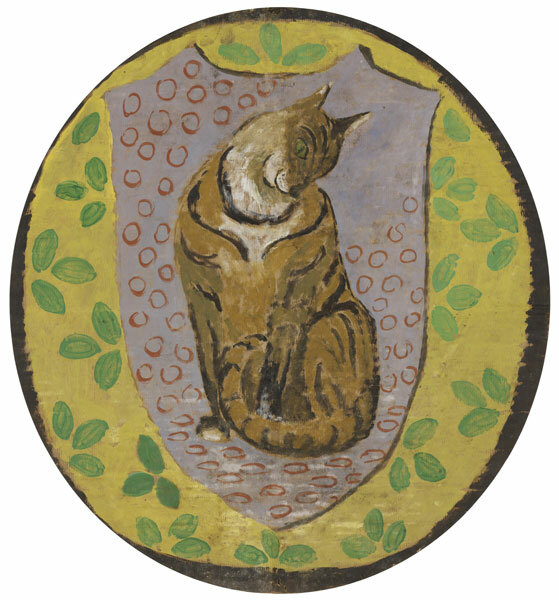 Vanessa Bell, Decorative design “Cat,” 1930s. Gouache on board, dia. 22 inches. Private collection. Image courtesy of the Herbert F. Johnson Museum of Art, Cornell University.